17 December 1935: Douglas Aircraft Company vice president and chief test pilot Carl A. Cover made the first flight of the Douglas DST, NX14988, at Clover Field, Santa Monica, California. Also aboard were engineers Fred Stineman and Frank Coleman. Designed over a two year period by chief engineer Arthur Emmons Raymond and built for American Airlines, the DST, or Douglas Sleeper Transport, was the original variant of the DC-3 commercial airliner. It had 14 sleeping berths for passengers on overnight transcontinental journeys, and could fly across the United States with three refueling stops. There were no prototypes built. NX14988 was a production airplane and went to American Airlines where it flew more than 17,000 hours. At the beginning of World War II, NC14988 was placed in military service, designated C-49E Skytrooper with the serial number 42-43619. On 15 October 1942, it crashed 2 miles (3.2 kilometers) from its destination at Chicago, Illinois, killing the 2-man crew and all 7 passengers. The airplane was damaged beyond repair. 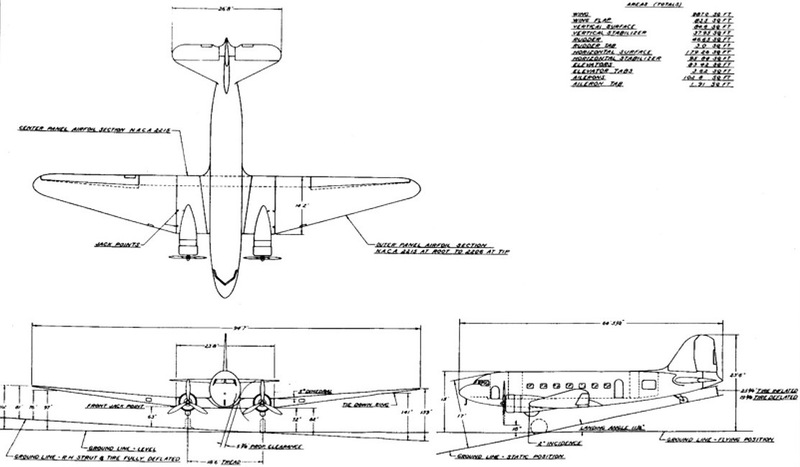 The DST and the DC-3 were an improved version of the Douglas DC-2 commercial transport. It was an all-metal, twin-engine, low-wing monoplane with retractable landing gear. The airplane was operated by a pilot and co-pilot. 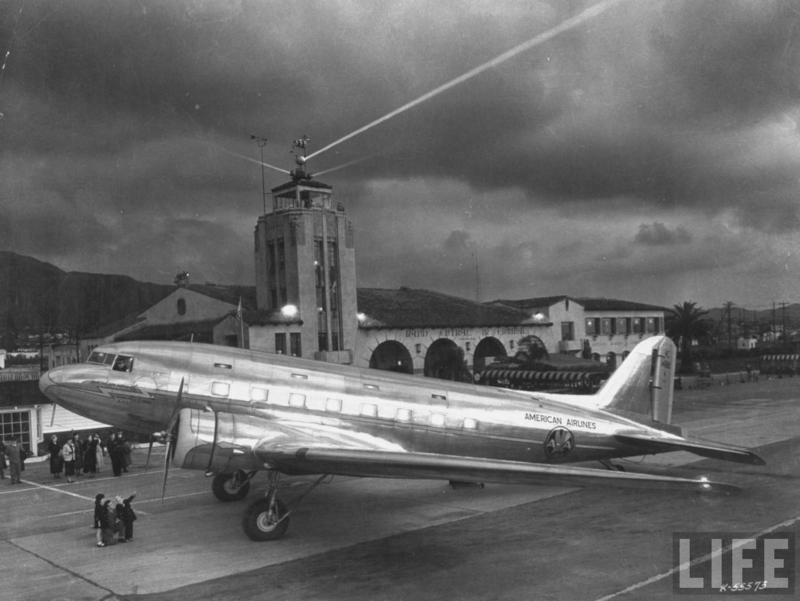 The Douglas DC-3 was 64 feet, 5½ inches (19.647 meters) long with a wingspan of 95 feet, 0 inches (28.956 meters). It was 17 feet, 0 inches (5.182 meters) high in three-point position. The wing center section is straight, but outboard of the engine nacelles there is 5º dihedral. The wings’ leading edges are swept aft 15.5°. The trailing edges have no sweep. The airplane weighed 16,384 pounds (7,432 kilograms) empty and had a gross weight of 24,400 pounds (11,068 kilograms). 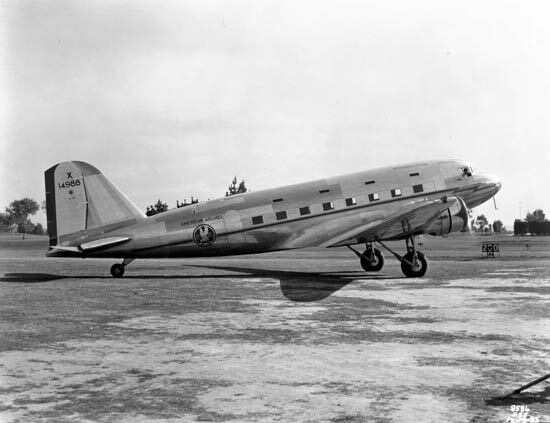 DSTs and initial production DC-3s were powered by two air-cooled, supercharged, 1,823.129-cubic-inch-displacement (29.875 liter) Wright Aeronautical Division Cyclone 9 GR-1820G2 9-cylinder radial engines, rated at 700 horsepower at 2,100 r.p.m., and 800 horsepower at 2,100 r.p.m for takeoff. They drove 11 feet, 6 inch (3.505 meters) diameter, three-bladed Hamilton-Standard Hydromatic constant-speed propellers through a 16:11 gear reduction. The engines were soon changed to more powerful 1,829.389-cubic-inch-displacement (29.978 liter) air-cooled, supercharged Pratt & Whitney Twin Wasp SC3-G 14-cylinder radials, with a normal power rating of 950 horsepower at 2,550 r.p.m., and takeoff power rating of 1,050 horsepower at 2,700 r.p.m. The SC3-G had a 16:9 propeller gear reduction ratio. It was 5 feet, 1.50 inches (1.562 meters) long, 4 feet, 0.19 inches (1.224 meters) in diameter, and weighed 1,457 pounds (661 kilograms). The DC-3’s cruise speed was 180 knots (207 miles per hour/333 kilometers per hour), and its aximum speed was 200 knots (230 miles per hour’370 kilometers per hour) at 8,500 feet (2,591 meters). The service ceiling was 23,200 feet (7,071 meters). 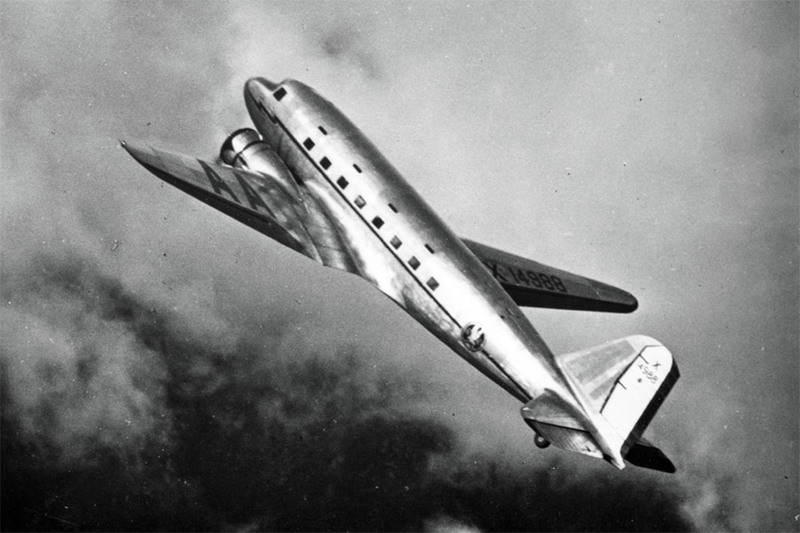 The DC-3 was in production for 11 years. Douglas Aircraft Company built 10,655 DC-3s and military C-47s. There were another 5,000 license-built copies. Over 400 DC-3s are still in commercial service. The oldest surviving example is the sixth DST built, originally registered NC16005. You need to proof read before posting. The wingspan of the DC-3 was not 64 meters, it was just over 64 FEET which converts to just over 19.5 meters (correctly spelled metres). Thank you for catching my mistake, Gary. “64.458” is the decimal equivalent of 64 feet, 5½ inches. I had converted to decimals from fractions, intending to convert to Metric, and apparently inserted the English units of length instead of Metric. Anyway, I have made the change in the article. “You need to proof read before posting.” REALLY??? Now, why didn’t I think of that before??? Do you mean, like, uh, writing “The wingspan of the DC-3 was not 64 meters. . .” when you are actually referring to LENGTH, rather than wingspan? You really should proofread (one word) before posting, Gary. Oh, and “(correctly spelled metres)”??? Maybe in Ontario, Gary, but TDiA is based right here in the good ol’ U.S. of A. The United States Department of Commerce, National Institute of Standards and Technology (NIST), Physical Measurement Laboratory, uses the word “meter” as a measure of length. The Society of Automotive Engineers (SAE) uses the word “meter.” The Institute of Electrical and Electronics Engineers (IEEE) uses “meter.” So. that’s it: m-e-t-e-r. Further, “meter” is an accepted word in the Oxford Dictionary of the English Language. 2 March 1978 I was a Security Specialist from George AFB assigned to the March 2, 1978 fatal crash that killed Major Charles Thomas Fulop, in a Republic F-105G Thunderchief, call sign “Thud 71.” Having read your article today you helped to fill in missing information on the crash that was far above my pay grade at the time. I sat with that crash site for well over a week. Haunting then as it is now. The mud, quiet of the canyon, the school and the irony of the Northrop building so close to the impact site.